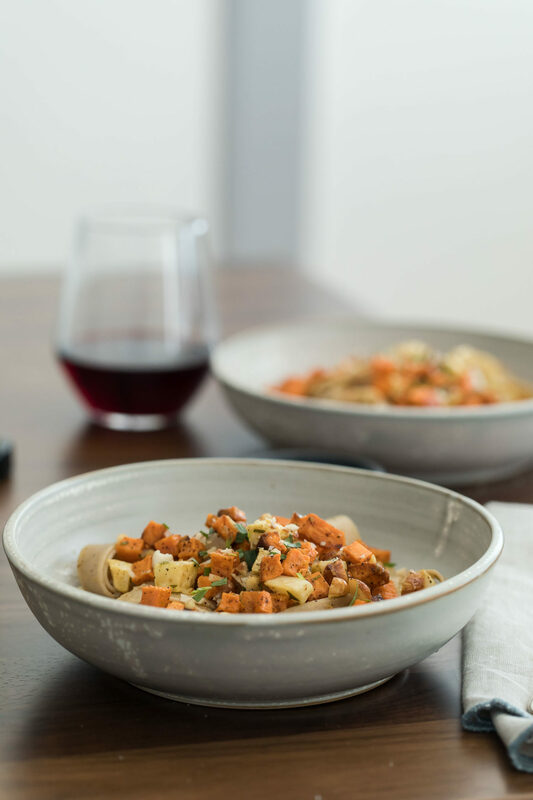 An sweet and earthy pasta dish that features roasted sweet potatoes and celeriac tossed with whole wheat pasta and an easy tarragon butter sauce. 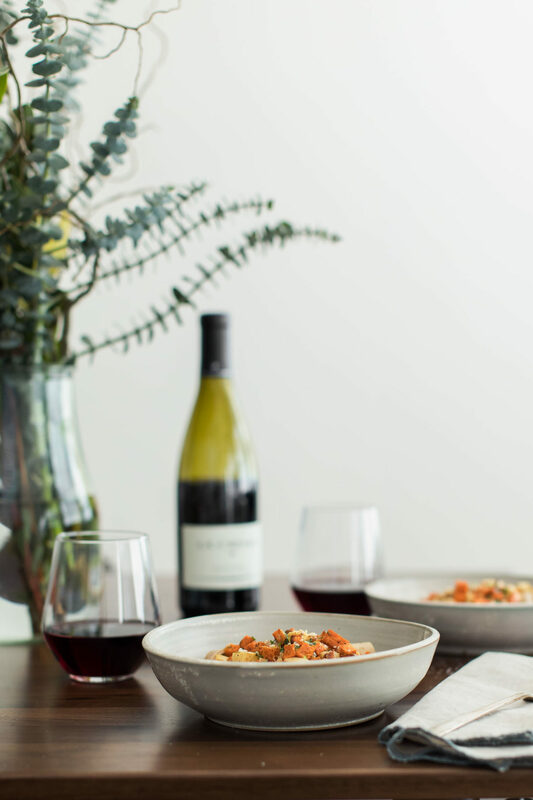 A perfect date-night-in or weekend dinner. Preheat oven to 425˚F. Peel the sweet potato and celeriac then cut into ½” cubes. Toss with the olive oil, salt, and pepper. Spread onto a sheet tray and roast until the vegetables are tender and starting to brown; 30 to 35 minutes. 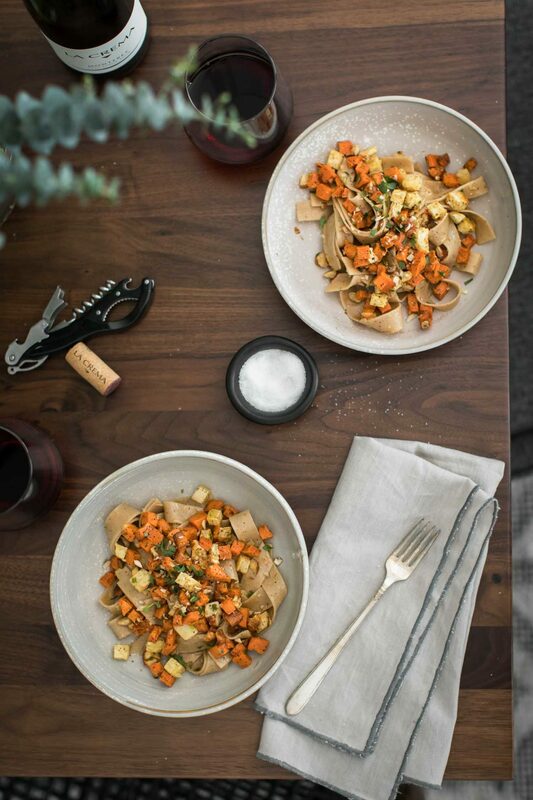 While the sweet potatoes are roasting, cook the pasta until tender. Drain and reserve ½ cup of pasta water. Set pasta aside. Return the pan used for pasta back to the stovetop. Over medium-low heat, add the butter and let melt. Add the hazelnuts and cook for a couple minutes, until fragrant. Stir in the garlic and continue to cook for another minute; just long enough for the garlic to become golden. Turn off the heat and stir in the lemon juice, zest, tarragon, and salt. Add in the roasted sweet potatoes and pasta; tossing until well combined. Add a splash of pasta water as needed to help the butter coat the noodles. This may or may not be needed. Serve with a sprinkle of chopped hazelnuts and minced tarragon if desired. Tip + Tricks: Make the sweet potato mixture ahead of time and let it warm with the butter sauce. This will help cut-down the day-off time. Grain Bowl: Swap out the pasta for your favorite grains. Roasted the vegetable then toss with the grains and the butter sauce. This also makes for a wonderful lunch the next day. Gluten-Free Use your favorite gluten-free pasta. I tend to stick with a more mild-tasting brown rice pasta but any will work. Vegan: While you could use a non-dairy butter, I prefer to switch over to olive oil. The flavor of the olive oil is a nice addition to the tarragon and sweet potatoes. Disclosure: This recipe was created in partnership with La Crema. All thoughts and opinions are my own. It’s content like this that helps me keep this site running to provide the vegetarian recipes you see every week.